Today we’re going to discuss some of the best time travel movies. Being a life-long Doctor Who fan, I’ve got a soft spot for time travel stories regardless of the medium – film, television, novel, audio, comic, etc. Before we get to that, I gotta describe to you where I’m sitting as I write this. Since today is my birthday, I think you can indulge me for a paragraph or two (truthfully, I’m writing this on Monday afternoon and scheduling it to post on Wednesday, my birthday. Geez, semantics!). I’m currently sitting on the balcony of my 14th floor hotel room in Fort Lauderdale. The sky is a gorgeous blue, there is a slight breeze, and the temperature is warm and relaxing without being too hot. Tropical music is being carried upon the wind up to my room from the Tiki Bar below. My balcony overlooks the beautiful pool, a marina full of impressive yachts, and the majestic river. In the distance you can see downtown Fort Lauderdale and the Atlantic Ocean. It’s so relaxing sitting here watching the boats idle their way up and down the river, the seagulls floating on the gentle breeze, letting the music flow through me, and generally unwinding. It doesn’t get much better than this. Okay… back to the topic at hand. My top 10 favorite time travel movies! 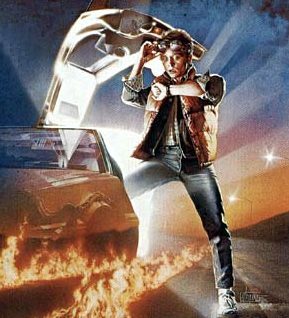 This list is in no particular order and was selected solely based upon the criteria of, “Hey, I like that movie.” For an impressively comprehensive list of time travel movies, check out Andy’s Anachronisms by clicking here. Back to the Future – A great film that manages to tackle the cause & effect of time travel, while injecting tremendous amounts of humor. Possibly the greatest time travel movie of all time. You can’t deny that Michael J. Fox is one of the best comedy-drama actors of the 1980s. Also worth mentioning are Parts II and III. Those are fun films, but the first one stands out as the best. Bill & Ted’s Excellent Adventure – Two headbanger idiots with a time machine! Just goofy, ridiculous fun. If you don’t like this movie, you have no sense of humor. Don’t watch the sequel. The Time Traveler’s Wife – A surprisingly good film! I didn’t exactly want to see this, especially after discovering that Eric Bana had a leading role. However, they used time travel superbly in this film. I highly recommend this one to anyone with an interest in time travel stories, or anyone who likes complex love stories. Planet of the Apes (1968 version) – Powerful tale of racial politics and a warning of the human race’s destructive nature. While time travel isn’t a major plot point throughout the movie, there is no denying the impact it provided at the end. Groundhog Day – A really fun Bill Murray’s film! A romantic comedy that uses time travel very cleverly. Also, one of cable televisions most aired movies ever. Seriously, go turn on your TV right now. It’s probably on. Somewhere in Time – A time travel romance starring Christopher Reeve and Jane Seymour. Wonderful love story set in the Grand Hotel on Mackinac Island, Michigan. Christopher Reeves was such an amazing actor! It’s a shame he didn’t have the opportunity to make more films. Interesting to note, a friend of my family had a bit part in this movie. Neat! Star Trek: First Contact – Such a good movie! This film rivals Wrath of Khan as being the best Trek movie. Though time travel provided the framework for this film, this movie is more about action and intrigue than time travel. Star Trek IV: The Voyage Home – Probably the most fun Star Trek movie. While this film lacked the typical Star Trek space battles, it made up for it with acting and time travel hijinks. I still enjoy this movie every time I watch it. Terminator 2: Judgment Day – I remember thinking when I saw this movie in the theater, “There will never be a movie made with more action than this.” I was obviously wrong, but the amount of action in that movie for the time was insane! This film did a good job exploring the “inevitable future” aspect of time travel. The first Terminator movie was also great, but I personally enjoy the second one more. Time After Time – A 1979 suspense thriller starring Malcolm McDowell and David Warner. H.G. Wells (McDowell) pursues Jack the Ripper (Warner) to the 20th Century when the serial murderer uses the Well’s own time machine to escape his time period. This film was directed by Nicholas Meyer, who went on to direct Star Trek II: The Wrath of Khan and Star Trek VI: The Undiscovered Country. Good movie. You should check it out. Frequency – A really smart film starring Dennis Quaid. In the movie an accidental cross-time ham radio connects father and son across 30 years. The son tries to save his father’s life, but then must fix the consequences. If you’ve never seen this film, it’s a MUST! It’s a Wonderful Life – My absolute favorite Christmas movie of all time. While not about time travel specifically, it does explore an alternate timeline without Jimmy Stewart’s character. Scrooged – Bill Murray at his best! This modern retelling of Charles Dickens’ A Christmas Carol is lots of fun. While it may feel a bit dated as it’s 20 years old, it’s still a nice update to this classic story. I’m sure some of you are thinking of other fantastic time travel movies that I left off the list. If so, let me know in the comments. I did consider every film on Andy’s Anachronisms list of time travel movies. Here are some of the films I definitely rejected from my list of favorites..
Timecop – Not a great movie, sorry. Time Bandits – Fun, but a little too out there. Timerider: The Adventure of Lyle Swann – Seriously? I’m gonna pretend you didn’t suggest that. Have you ever heard the song, “I am my own Grandpa”? I think it was written for this movie. Butterfly Effect – I know many people praise this film, but I was turned off by it. 12 Monkeys – Another lauded movie, but I didn’t love it. Donnie Darko – Bizarre movie. I enjoyed it, but it’s not on my favorite list. The Time Machine (2002 version) – I didn’t really enjoy this film. Great book, blah movie. I never saw 1960 version, but I understand it’s good. Okay, your turn. Tell me I’m right. Tell me I’m wrong. What are your favorites? Liking most of them, haven’t seen Time after time or The Time Traveller’s Wife but like all the others in the list. Also agree with some of the ones you didn’t like… it’s still a mystery to me how The Butterfly Effect got not one but TWO sequels, even if they were straight-to-DVD. Timecop, I think it’s fun but I would agree it’s not a GREAT timetravel movie. Buill & Ted’s Excellent Adventure is one of the best films ever made, period! I just watched it again a few weeks ago and this movie STILL HOLDS UP to how AWESOME it was when I was a kid. That is saying something! The original The Time Machine is one of the best science fiction/fantasy films of the 60s. Check it out! And who can argue with BTTF? I’m a huge fan and so is my wife. BTTF3 is a personal favorite, mostly because I am a huge Western fan! Pretty good list. You should check out Timecrimes, an awesome Spanish time travel movie. Planet of the Apes was not, technically, a time travel movie. Escape from the Planet of the Apes was. While ST: First Contact was entertaining, I find that after repeated viewings the movie was very disjointed and annoying. Running two stories simultaneously may work in an hour-long tv episode, it didn’t here. Timeline by Michael Crichton Great book, ok movie! Primer is by far the most interesting and intricate time travel movie ever made. Time Crimes is another time travel movie that was very interesting and entertaining but it was from Spain so not many Americans saw it. I highly recommend both these movies. Nicholas Cage equals “no”? I find this to be true for all movies! I baked you a planet, but Galactus ate it. Hi, this is your old friend, Heather Mendelson. Just saw your blog URL when wishing you happy birthday on Facebook. I just wanted to say that I love time travel stories/books/movies. What did you think of the most recent Star Trek movie? Also for alternate timelines, did you see Sliding Doors? Heather – Thanks for visiting! In hindsight, I definitely should have mentioned the new Star Trek movie. It doesn’t make my Top Ten, but it was still a really fun movie. It did a good job exploring the alternate timeline concept. Never saw Sliding Doors. I’ve had the chance, but I’ve always passed on it. My thanks for all the birthday wishes! Y’all are great! And thanks for the suggestions for “Primer” and “Time Crimes”. Sounds like I definitely need to check those out. Let me recommend The Grand Tour (aka: Grand Tour: Disaster in Time)which is a neat little SF thriller, if a bit hard to find. More love for Primer here! My Top 10 would definitely have that and 12 Monkeys (I love its intricacies). Hi. Just wanted to thank you for a great article. We enjoyed it so much we posted it on our LifeSpace Community Blog: http://blog.lifespace.com. Great stuff! Makes me want to watch a few of these classics this weekend. I’ve been compiling my own Top Ten list for a while. I think time travel movies are very subjective and everyone is going to have different favourites. Here’s a brief review of Time Crimes by the way. So, have you checked out Primer and Time Crimes yet? These are amazing films. Not yet. I really need to. Thanks for the reminder! dude! you’ve gotta check out “Frequently Asked Questions About Time Travel”. It is Epic. Ever seen Primer? Awesome time travel movie. Also, Timecrimes (los cronocrimenes) is a spanish film that’s pretty awesome. Primer belongs on the list for sure. Bill & Ted could come off, though I too loved it. wow, just read through the comments and realized i’m like the millionth person to recommend Primer and Timecrimes. If you haven’t seen them yet, you haven’t seen good time-travel movies. watch them now. there was a tv show in the 90s in Australia, I watched as a kid called “The girl from tomorrow” kinda interesting. Okay, an update to this older post. I’ve now watched “Primer” and “Time Crimes”. I agree that “Primer” should most likely be on this list. It featured some really mind-blowing time travel. Really ambitious project for such minimal production expense. Now was it a phenomenal movie (time travel aside)? Probably not, but it was definitely good. I’d be willing to add it to this list. “Time Crimes”, however, was a huge disappointment for me. It was incredibly predictable. There were almost no surprises in this movie for me. I think it’s got a reputation because it’s obscure and Spanish, beyond that it doesn’t rate high enough for my list. Don’t get me wrong, it wasn’t a bad movie, just not one of the best time travel films ever.